It’s been hot in Tennessee this week. Sticky. Miserably hot. 95 degrees and high humidity. I don’t love heat. I prefer mild temperatures. And while I’m a fan of the summer schedule and the sunny skies and the growing garden out my window, I am a firm believer that it is easier to get warmed up when you’re cold than to get cooled off when you’re hot. When I was a teenager, we talked about being hot and I expressed my misery when it was “hot sticky and wallery”. I worked at a camp as a junior counselor and my handle on the walkey talkey was ADHESIVE, lovingly given by our friend Tim. He knew how much I loved being hot, sticky and wallery. All that to say, I don’t love being sticky with sweat from the heat. I’d prefer being wrapped in a quilt, drinking a cup of coffee. This week has been so hot that I have felt the need to say out loud, “It’s hot!” Do you do this? And say it again and again to everyone you encounter on your walk, or in a parking lot, or to a neighbor you see. I don’t know why we do this… is it because somehow it feels like it lessens the agony if “named”? I usually find that to be true in my life. At our church, which meets at an elementary school, there are frequently odd celebratory decorations left in the auditorium where we meet and it feels like we need to publicly acknowledge that this is distracting and not our doing. We need to say out loud, “Interesting decorations this week”, or “Chinese New Year is approaching – as you can see by the hanging paper lanterns and large dragon displayed”. And when the drum corps began drumming during the sermon each week for a couple of months, it was such a distraction, that we were relieved that our pastor acknowledged what we were all thinking. Somehow putting it out there sets things more at ease. It confirms that people know what the situation is and are better able to embrace it. Naming it – an important life skill. I was talking to my friends Amy and Catherine about this need I feel to express my hotness often on these fuming days. They both wholeheartedly agreed. In fact, Catherine, my world-traveling friend, said she has observed this as universal. All over the globe, she hears people acknowledge verbally the heat (or cold). Regardless of region that she has visited– Spain, Japan, Australia, etc. – on miserably hot days, people talk about the heat. So, maybe it’s human nature. Other than saying “it’s hot”, what can you do on these hot days? 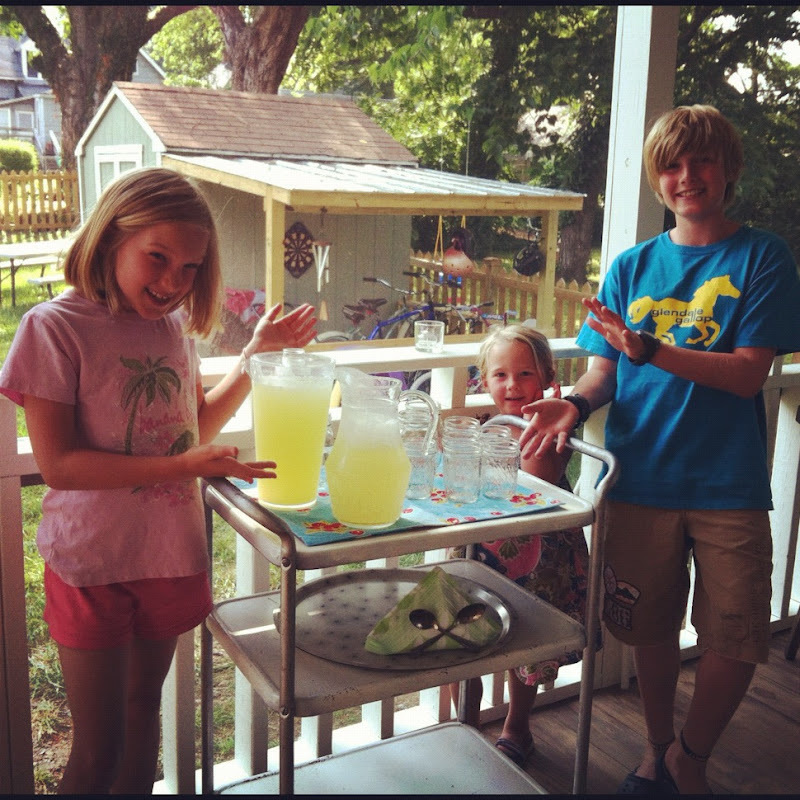 Drink Lemonade (and lots of water). Get your body in a pool. Make Lemon Freeze for dessert. So this is what we have done this week. It’s the only way to beat the heat. “what’s in this pie? It’s creamy and zippy”. This simple dessert was one from my childhood. My mom made it frequently when we grew up and it’s still a favorite of mine. It’s super easy and a tasty hot-weather treat. Set ice cream and lemonade on counter to thaw. Crush graham crackers. (I put them in a large ziplock bag and crush with a rolling pin). 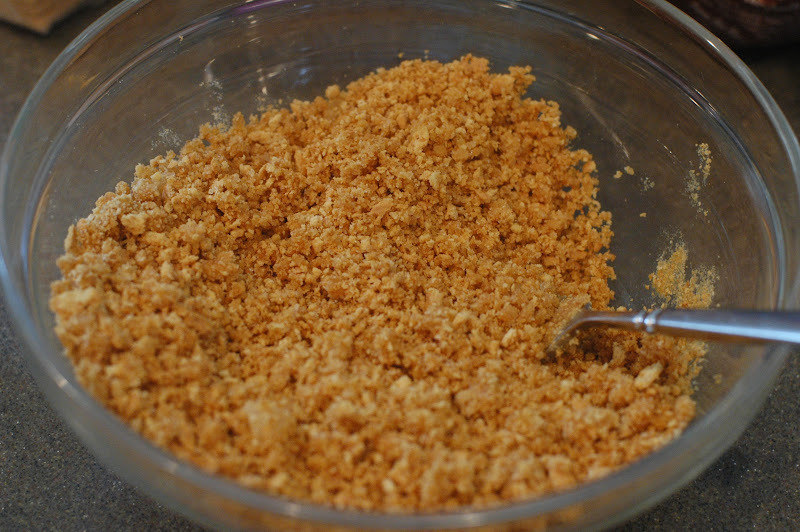 Mix with sugar and melted butter until fully incorporated. Press into a deep pie plate or a casserole dish. 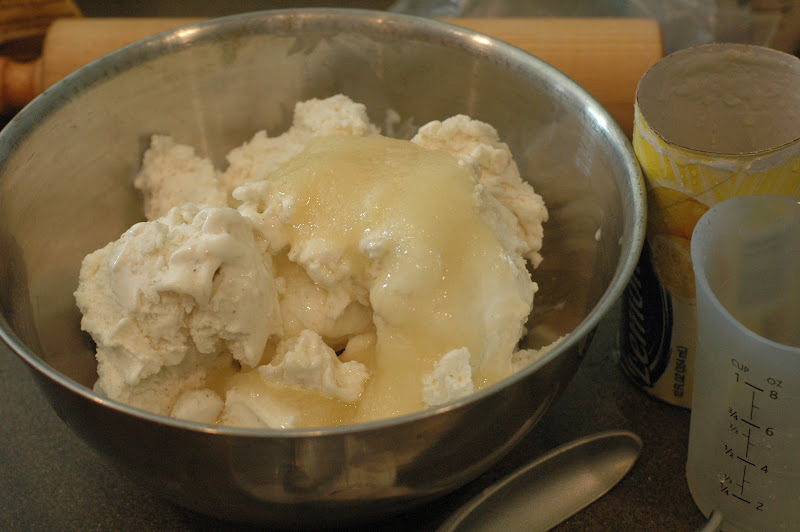 When ice cream and lemonade are softened, dump into a large bowl. (You can add a few drops of yellow food coloring to the lemonade before mixing to add a little color and to help indicate how well it’s blended). 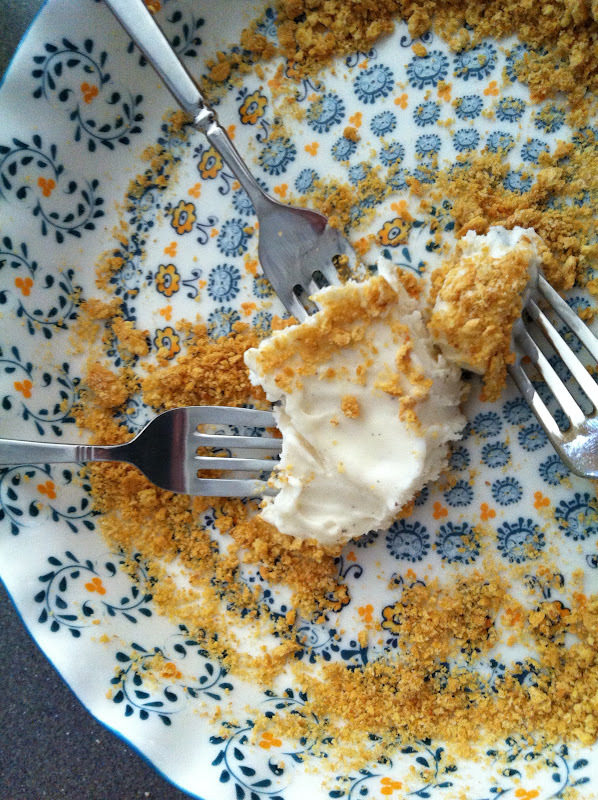 Sprinkle with the crumbs of 1 graham cracker. 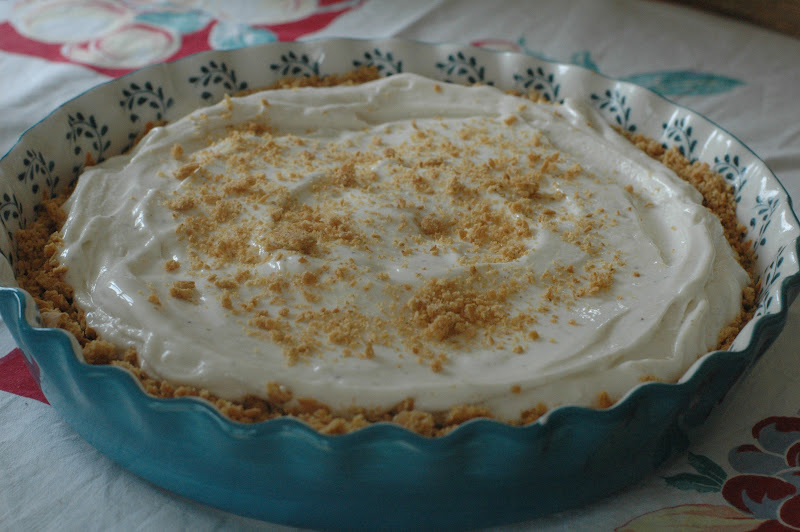 The only challenge with this recipe is that it calls for a ½ gallon of vanilla ice cream and unfortunately, it’s hard to find ½ gallon cartons of ice cream these days! You just have to make it work and adjust to what you can find. Julie, you and your family are the jolliest! This post makes me psyched about being back in Nashville…which is probably the same temperature as India but with pools and AC 🙂 Love you! Hopefully I'll run into you sometime soon! Megan, YOU are the jolliest! And the only friend I know that uses that word in their vocabulary… I love it. We miss you! I hope you are doing well. I am coming to India in July…to Mussoorie! I just found your site through A Holy Experience, and this is Pink Lemonade Pie! 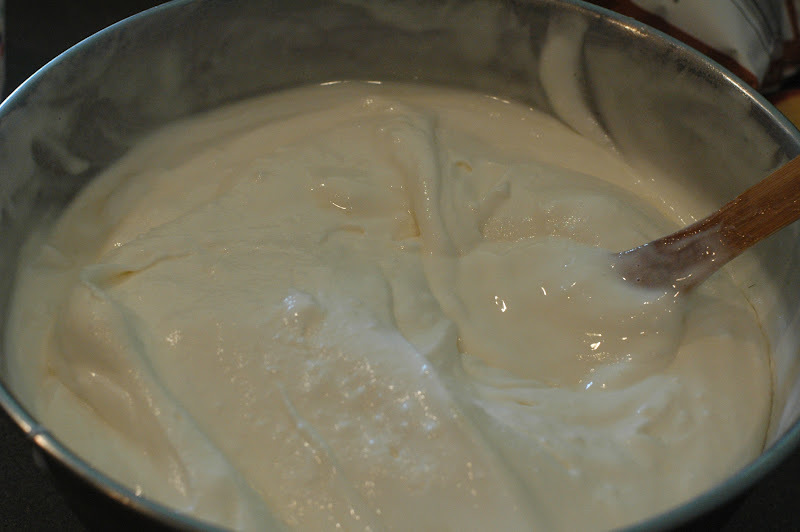 We used to make this with frozen pink lemonade, condensed milk, and coolwhip. So glad it can be made with less ingredients. have to make this again! Blue Bell is a brand that still makes real 1/2 gallons of ice cream. They go on sale from time to time and their Homemade Vanilla tastes wonderful. 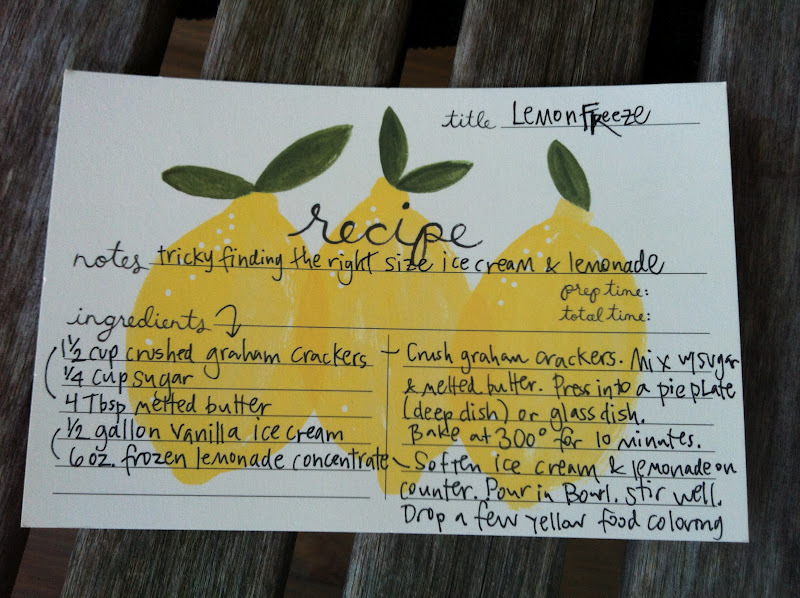 This sounds like such a wonderfully easy summer treat. Thank you. Yes, Dineen! Blue Bell still sells 1/2 gallons…Good ole Blue Bell and YES, the vanilla is great. I too watch for the sales. Have you had the Berries and Vanilla? Or the Banana Pudding? They are amazing. My family members can't control themselves when it's in our freezer. 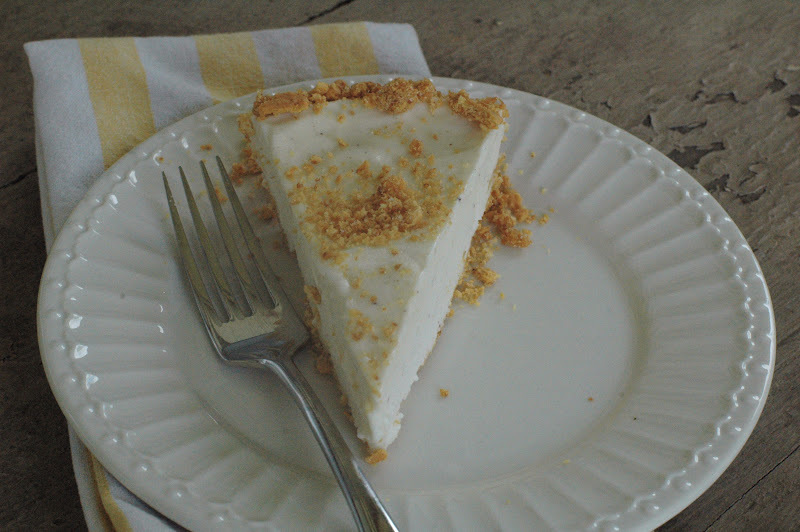 I do love a pink lemonade pie – with condensed milk. It is a favorite one too. Thanks for reading and commenting. How fun that Ann V. linked this to her blog! I'm attempting this recipe but as a gluten-free, dairy-free and (almost) sugar-free dessert. Hopefully that doesn't translate into taste free. Thanks for the idea! I grew up with this too except ours was as follows: Whip a pint heavy whipping cream until stiff, squeeze several limes into whipped cream (its really to taste & depends on limes but you want a strong lime flavor & it usually takes about 8-10), fold lime juice & a can of sweetened condensed milk into whipping cream & pour over a graham crust & freeze for 3-4 hours. The crust I always do the same but I bake it at 375-425 for 5-10 min to the crust doesnt brake when your eating these.